Irrational behavior is never fun to deal with. Unfortunately, it can come from all different directions. Could be a friend, an employee, a family member, heck…it could even be you! The key is to know not only how to deal with it, but how to prevent it. Albert Ellis, a noted psychologist from the late 50’s and early 60’s proposes that each of us hold a unique set of assumptions about ourselves and our world that serve to guide us through life and determine our reactions to the various situations we encounter. That unique set of assumptions might be irrational or partially irrational. There’s a thee step model for addressing irrational behavior and it’s called the ABC Technique of Irrational Beliefs. The first three steps “analyze the process” of how a person has developed irrational beliefs. Watch the video now and discover the ABC’s of dealing with irrational behavior. This process is recorded in a three-column table. Subscribe to our blog to have weekly business growth strategies and tips delivered to your inbox every Saturday morning. And if you’re interested in setting up a call with Coach John, please visit the calendar. Yoiur videos are great. I always learn from them. Thanks! Keep them coming. PS: OMG . . . I’m completely irratonal. John, having been a consumer of psychological services, in particular I spent a several year period working RBET therapy, I wonder if you think it wise as a coach to bring psychological methodology into business consulting or coaching. One of the reasons that the therapy world moved on from Ellis was that RBT ABC analysis was not particularly helpful in uncovering self deceit or lying. Do you worry, as a business coach, that you will unearth issues that are better handled by a psychologist than a coach? Please note that I say this as a consultant who has literally referred clients to mental health professionals. 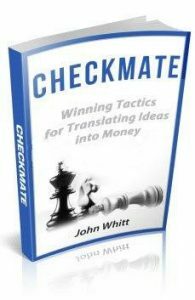 The ultimate victory in the strategic game of chess, a timeless competition dating back to the 6th century. I’ve coached and trained countless professionals and business owners JUST LIKE YOU over the years to clarify their goals, make their plans, execute and adapt, all in a quest to achieve the goals & dreams they only ever hoped might be possible someday. Copyright 2019 © Business Whitt. All rights reserved. This simple system will help you scale and grow a high-profit business — without adding hours to your work day!